The patient in this case had a several level lumbar fusion - from T7-S1. The surgeon didn't believe he was shifted but if you see the video from here http://www.themanualtherapist.com/201... - you can clearly see his shift in standing is quite apparent. Upon follow up, I learned that his R lateral support rods had broken sometime ago - the fusion is several years old. This is why he is laterally shifted to the right. He has no pain, just loss of stability, balance, and ability to load his left LE. The loading and gait were addressed on the first visit. The follow up, I gave him some trunk rotations as the shift was mainly in his thoracic spine. 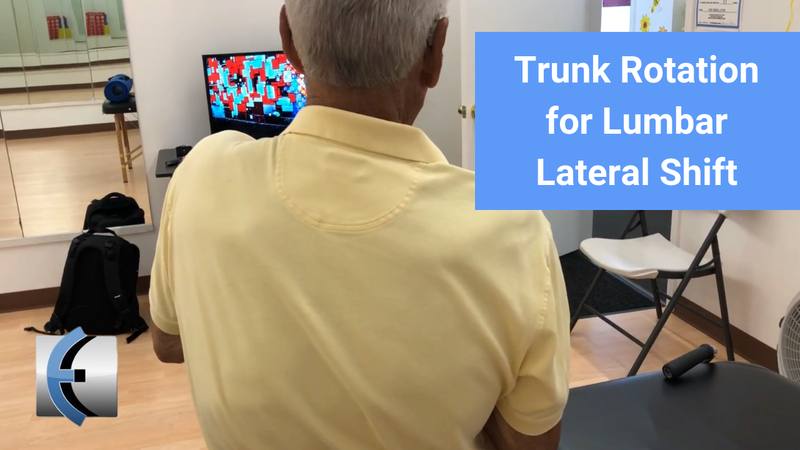 He was SB L and rot L, so I instructed trunk rotation R with emphasis on R scapular depression and retraction and L scapular elevation and protraction. After several sets of this, you can see the changes in seated shift. While this did not change his WB shift too much, I feel that will improve with the continued loading strategies we improved. He is not concerned about the shift, because he is asymptomatic, only want to be able to WB with better stability on his L LE.